The world leading, permanent impregnating sealer developed by Dry-Treat. ·Unique impregnating sealer technology. Specially engineered molecules penetrate much deeper, and bond permanently inside the sealed material. ·Lasts many times longer than other sealers and provides unparalelled protection. ·Permanent sealer designed for indoor or outdoor use. ·Protects against water and oil-based staining. ·Protects from salt attack and freeze thaw damage. ·Ideal as a wall, counter-top, facade or floor sealer. ·Engineered for sealing natural stone, paving, tiles, grout and concrete. ·Sealed areas keep their original appearance, become easier to clean. ·No special cleaners are required. Standard non-acidic cleaning chemicals will not harm the sealer. ·STAIN-PROOF Original™ even stands up to commercial cleaning techniques such as high pressure hosing. ·Maintains slip resistance of the surface. ·Suitable for homes and large scale commercial applications. ·Written 15 year performance warranty is available when STAIN-PROOF Original™ is applied by a Dry-Treat Accredited Applicator. 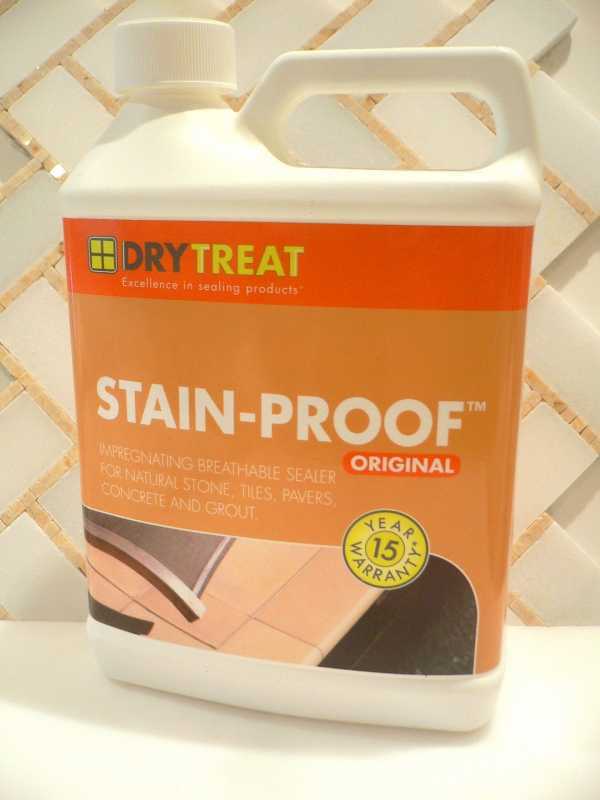 ·STAIN-PROOF Original™ has proven its worth in homes and iconic buildings, malls and monuments all over the world. ·Available and in stock at The Tilery.